On Saturday 5th October, 12 of us got muddy in the name of charity. As part of our pledge to raise £10,000 for Combat Stress we took part in the Kent Messenger Assault Course Challenge at Fowlmead Country Park’s permanent Confidence Course. We did a walk through of the course to begin with and it seemed OK so we started the real thing with confidence. Our two teams went head to head and it started off pretty close. The obstacles included climbing over and under wooden beams, running over tyres, balance beams and crawling through tunnels. 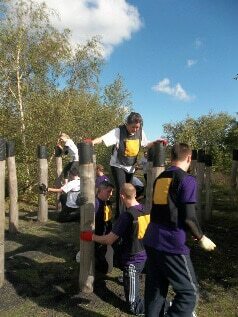 The most difficult obstacle by far was the poles! These poles had little groves cut into them for footholds but they weren’t really big enough and with muddy feet, every time you tried to move from one pole to another your foot slipped out! Sleeping Giant Team 2 had the right idea and lent each other a knee to climb across. It took Team 1 a few minutes of trying in vain to complete the obstacle without falling down before they too knelt down and let their knees bridge the gap between the two poles! This was a pretty awesome display of team work. 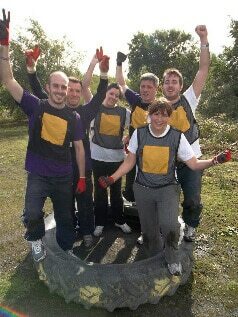 We eventually reached the finished line, by all jumping into a tractor tyre, bruised, knackered and some of us bleeding! Team 2 finished in 7 minutes 45 seconds (19th out of 35 teams who took part) and Team 1 finished in 9 minutes 34 seconds (30th out of 35). The fastest team were from the Spires Academy with 4 minutes 25 seconds and the slowest team took 10 minutes 48 seconds. Once we were done, a splinter group from Sleeping Giant asked if they could have another go! Crazy fools! This team of 4 managed to complete the course in an unofficial time of 4 minutes 7 seconds. This video was made with video footage taken by Luke’s wife, Isabel, and Chris’ GoPro strapped to his chest! The best bit is when he crawls through the tunnels because it looks like he’s going super fast! So far we’ve raised £132 towards our £10,000 target. This is just 1% so we’ve got a long way to go. Please help us reach our target by donating!